JHM received the American Public Works Association "Project of the Year Award" for our emergency road repair projects - J.H. 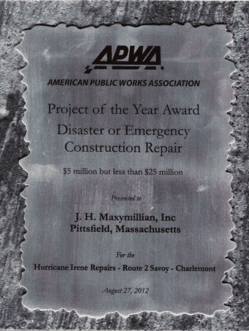 Maxymillian, Inc.
JHM received the American Public Works Association “Project of the Year Award” for our emergency road repair projects in response to the Hurricane Irene damage. Within hours after the storm JHM crews mobilized to reshape rivers, repair roads, protect and repair riverbanks, and replace culverts.